Sometimes the foot has a very flat arch and as it goes through the biomechanics necessary for running, it rocks too far on the outside (supination) as well as the inside (over-pronation). 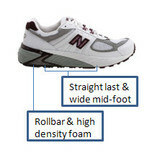 These feet require motion control shoes that have built in resistance on both sides of the shoe. Supporting the foot so that it goes through the running gait properly can keep ankles, shins, and knees from twisting excessively.